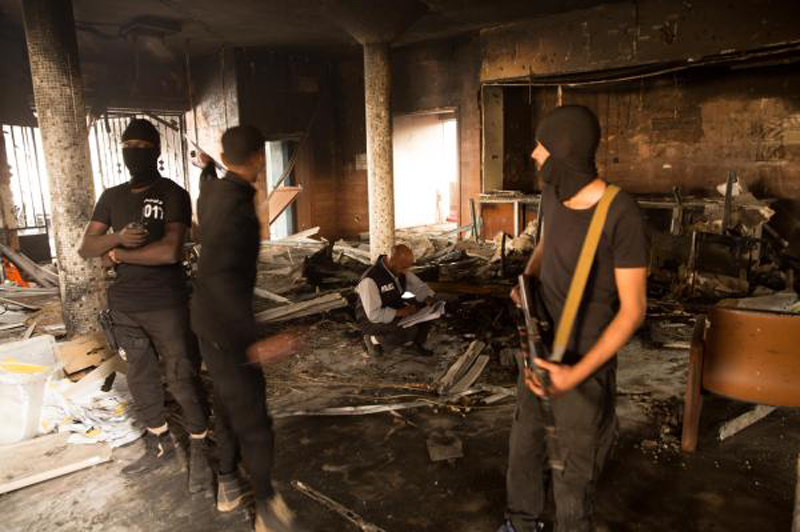 At least 12 people died Wednesday at Libya's electoral commission headquarters in the capital when two suicide bombers blew themselves up. The Islamic State said 15 people died in the assault. Libyan officials said 12 were killed, including at least two of the commission's guards. Two fighters, Abu Ayoub and Abu Tawfeeq, were dispatched to "target the apostate ballot stations," according to the Islamic State. "This breach targeted democracy, not just the HNEC," Emad al-Sayah, the electoral commission's director, said at a news conference. "The choice and future of Libyans were targeted." The commission, which has registered nearly 1 million new voters across Libya, said the database wasn't damaged. A date hasn't been set for the elections in Libya, which has two competing governments in the east and west. "My understanding is that there were two or three attackers who moved in on the administrative building," Otman Gajiji, a former chairman of the electoral commission, said to The New York Times. "One of them went upstairs and started setting the selections materials on fire, while a second one was downstairs providing cover. It seems that their target was the elections materials stored in the administrative building." Ghassan Salame, the United Nations special representative for Libya posted on Twitter "such cowardly attack on this democratic edifice is a direct aggression against the Libyan people and their will to build just and civil state, and against their hope of finding ways out of the transitions to establish peace and stability across." The U.S. State Department, in a statement, said: "This terrorist attack against a key pillar of Libya's fragile democracy only deepens the United States' commitment to support all Libyans as they prepare for credible and secure elections." It was the deadliest attack since U.S. airstrikes and Libyan militias expelled the militants from Sirte more than one year ago.